Q. Is it possible to walk on glass? Would it be safe to walk on a piece of 1/2 inch-thick, tempered glass if it is supported on all four sides? under what circumstances the person or people would be walking on the glass. 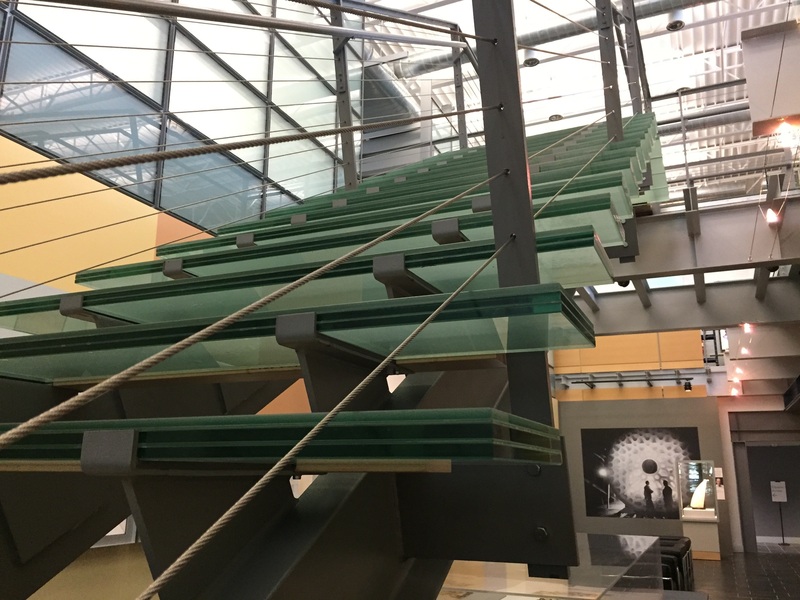 In fact, the stairs here at the Rakow Research Library are made of glass! The picture to the right shows our glass stairs and reinforcements, and we also have some glass walkways overhead. Glass can be very strong, much stronger than structural steel. However, because glass has relatively low fracture toughness, such strengths can only be achieved when it is virtually free of defects, as a freshly drawn glass fiber might be. Normally glass will contain defects, the surface being particularly prone to being scratched, chipped or attacked by the atmosphere. In this condition, the glass will fracture. The behavior is brittle, with no ability to redistribute load or impact energy. To counter the fragility of glass , the indutry has developed a number of methods to strengthen it. These do not change its nature, but either raise the threshold at which cracking occurs, or incorporate additional ductile materials that absorb energy and therefore prevent total failure when a unit has cracked. Among these, the tree most commonly used methods are toughed or tempered glass, laminated glass and wired glass. GANA Glazing Manual: The GANA Glazing Manual is recognized as the definitive source in the glass and glazing field. This manual includes complete information about primary and fabricated glass products, quality standards, design considerations, general and specific glazing guidelines and glazing in hazardous locations. Formerly published by the Flat Glass Marketing Association (FGMA), this manual is frequently referred to as the 'industry bible.'"